I wonder what happened next . . .
Wow – what a magnificent piece! Certainly a stunning piece. What was the shape of the dress? I can imagine a straight design – of course it would look beautiful with a mandarin collar! Did you see Antique’s Roadshow last week? The great granddaughter of Lady Leverhulme had recognised her ancestor in a photo from that previous show. She had contacted the person the photo belonged to (and who had a piece of jewelery worn in the photo) and now she brought it in, along with several other pieces of jewelery from the same photo. …It just occurs to me that someone, someday reading this might be the owner of the Pastel Imperial Dragon! Kai Lung – my father has two or three of the books and I was reading them from when I was very little: far too young to make much sense of them, far less prise apart the traditional Chinese components from the engaging whimsy added by the author. Your dragon is very handsome, and must have looked stunning on a dress. I did a good deal of embroidery while visiting my mother in hospital during her final weeks last year. It was very soothing to me to stitch and gave us something extra to talk about when she was awake. The nursing staff raised no objection – in fact they enjoyed watching the embroidery progress. (Of course, these were just small pieces worked in the hand.) I would have found things a lot harder without my stitchery to keep my hands busy and calm my mind. Magnificent!! I know it gave your mother great joy to have you sitting by her side, embroidering this fantastic design. Kai Lung is fabulous! And I enjoyed reading your ‘back story’. Very handsome. I really like the rich colours you have used. It must have been very eye catching on the back of your dress. Dragons seem to have special personalities of there own once you stitch them, either by hand or machine. I love this one. Thhe dragon is stunning! I do hope the firescreen survived, but a lot of peope aren’t aware of the work that goes into needlework, and don’t appreciate its beauty. Nested fly stitches for scales! What a great idea! Several, if not all, the Kai Lung books are now on Gutenberg, by the way. oh yes….I hope the screen went to a very good home too. I wonder what happened to it? The curiosity would test me…. 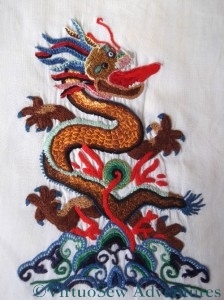 Chinese embroidery is very famous and dragon implies emperor and power. Stunning piece. What an important memory…you sitting by your grandmama’s bedside to keep her company. I’m sure you brought her great joy. And that dragon is pretty cool…I can just imagine showing up to play bridge in your dress. The opponents would drop like flies! Can’t you inquire about the screen?? ?